Nikola Y. Kolev1, Valentin L. Ignatov1, Anton Y. Tonev1 , Aleksandar K. Zlatarov1, Elitsa P. Encheva2, Tanya N. Kirilova1, Vasil M. Bojkov3, Krasimir D. Ivanov1. 1) Department of General and Operative Surgery, 2) Department of Nuclear Medicine, Metabolic Therapy and Radiotherapy, 3) Department of Surgical Diseases University Hospital “St. Marina” Varna, Bulgaria, Medical University of Varna, Bulgaria. BACKGROUND: Laparoscopic adrenalectomy (LA) has become the procedure of choice to treat functioning and non-functioning adrenal tumours. With improving experience, large adrenal tumours (> 5 cm) are being successfully tackled by laparoscopy. MATERIALS AND METHODS: Thirty-eight laparoscopic adrenalectomies was performed for adrenal lesions during the period 2006 to 2012 were reviewed. RESULTS: A total of 35laparoscopic adrenalectomies were done in 32 patients. The mean tumour size was 5.03 cm (2-11 cm). The lesions were localised on the right side in 17 patients and on the left side in 15 patients, with bilateral tumours in 3 patients. Functioning tumours were present in 32 of the 46 patients. The average blood loss was 112 ml (20–400 ml) with the mean operating time being 144 min (45 to 270 min). Three patients underwent conversion to open procedure. Three of the 32 patients (9.52%) on final histology had malignant tumours. CONCLUSION: LA is safe and feasible for large adrenal lesions. Mere size should not be considered as a contraindication to laparoscopic approach in large adrenal masses. Graded approach, good preoperative assessment, team work and adherence to anatomical and surgical principles are the key to success. Kolev NY, Ignatov VL, Tonev AY, Zlatarov AK, Encheva EP, Kirilova TN, Bojkov VM, Ivanov KD. OUR EXPERIENCE IN LAPAROSCOPIC ADRENALECTOMY. J of IMAB. 2013 Jul-Dec;19(3):461-464. 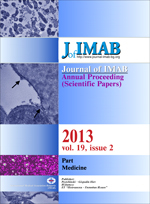 DOI: 10.5272/jimab.2013193.461. 11. Thornton JK. Abdominal nephrectomy for large sarcoma of the left suprarenal capsule: recovery. Trans Clin Soc Lond. 1890; 23:150–3. 23. Kebebew E, Duh QY. Adrenal Incidentaloma. In: Cameron JL, editor. Current surgical therapy. Philadelphia: Elsevier Mosby; 2004. pp. 575–9. 26. Ramírez-Plaza CP, Rodríguez-Cañete A, Domínguez-López ME, Valle-Carbajo M, Jiménez-Mazure C, Marín-Camero N, et al. [Development and evolution of laparoscopic adrenalectomy in an specialized team: From the beginning to the outpatient setting] [in Spanish] Endocrinol Nutr. 2010; Jan;57(1):22–7. [PubMed] [CrossRef] .